You might not hear bluegrass music and think of Australia, but you should. Luthier Paul Duff is making some of the finest mandolins in the world down there, replicating the Lloyd Loar-era Gibson F-5 mandolins made famous by Bill Monroe. Of course, if you tell Paul that, he’ll humbly say he’s still just trying to figure it all out. We were lucky enough to sit down and hear from a true craftsman about the extreme lengths he goes through to choose his wood, his meticulous carving process, and his love of imperfection. 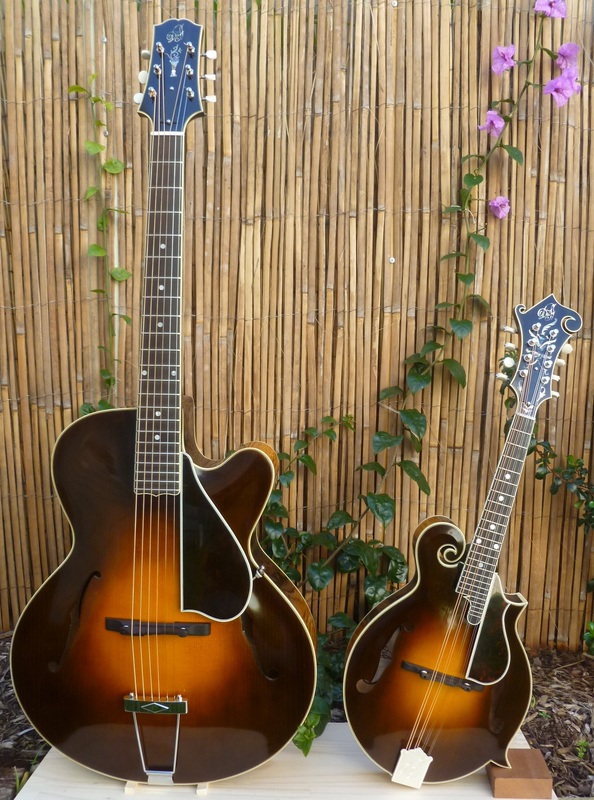 Paul Duff: This is the second batch in a row that I’ve got a matching pair with an L-5 archtop guitar and an F-5 mandolin. 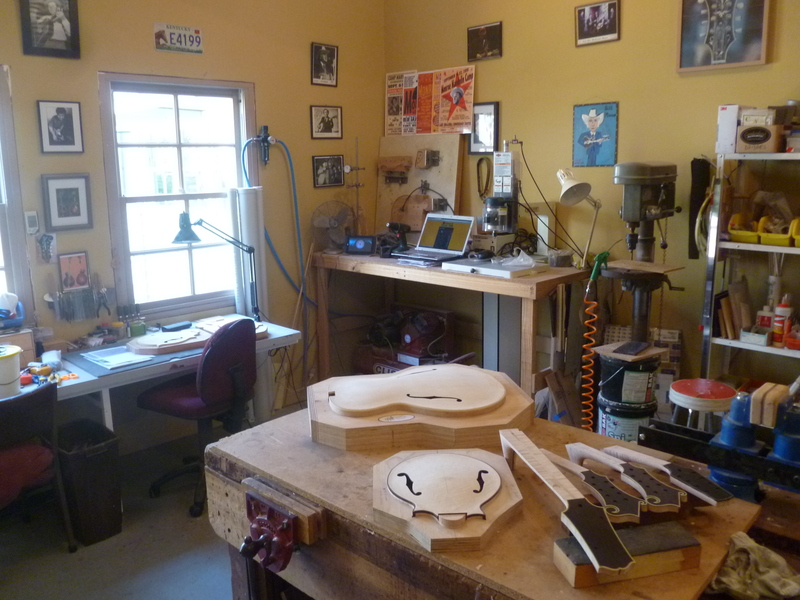 I’m also working on a standard spec F-5 mandolin and a newly designed A-5 two-point mandolin. FJ: How did you get started building? PD: I originally got into building because I started to play. There was music in my family, and I really enjoyed it, but I hadn’t yet been inspired to play. Then I came across a bluegrass band and I fell in love with it. I started to play mandolin in a bluegrass band and at that time, which was 1979, especially in Australia, the availability of instruments was very small. I had an Ibanez A-5 mandolin which was good at the time. But in terms of wanting to get an F-5, you didn’t have many options. The best affordable one at the time was made by Ibanez. You definitely didn’t have much access to any Gibsons, and if you did, they were very expensive. It was a case of, “I’m playing this instrument and I want something better, but I can’t afford to buy it.” I started looking into the idea of building one after I’d been playing for about three or four years just to get something better for myself. FJ: How much bluegrass is there in Australia? PD: There weren’t a lot of bluegrass bands around, so it was a case of hunting it out. I literally walked into a bar in Fremantle and saw a bluegrass band and I got to know those guys. Now there are some bluegrass players around and there are more organized bluegrass bands. When I started, there were no bluegrass festivals, perhaps one on the east coast of Australia. Now there are probably half a dozen bluegrass festivals—maybe even more—all across Australia. The funny thing about bluegrass is that it comes from a very specific region, yet it’s really an international music. You see it in every country now. I see it in building instruments and shipping them to people all over. FJ: Can you tell us about your shop? Where’s it located? PD: My workshop is part of my home, at the back of the house. Before we did a renovation and built the shop, I spent many a day in backyard sheds and garages. It can be great at times working from home and it can be difficult. It’s very easy to walk into the workshop and work a little longer than I should rather than taking a break, but it’s fifteen steps to work every morning. Not too bad a commute. I live in Perth which is on the coast of Western Australia, and it’s a city of about 2.2 million people. I’ve heard people say that it’s technically the most isolated city in the world, which has its benefits. It’s a beautifully pristine part of the world, and I don’t mind flying and driving to get around. FJ: You’ve talked about building with a very traditional process (choosing not to use CNC or other forms of automation). When and why did you decide to stay completely “hands-on,” as you call it, in your building process? PD: I definitely stay away from CNC, but I do have some automation. I have a pin router that helps me produce the two-dimensional things like peghead veneers and fingerboards. I also have a handheld pantograph router for getting rid of what I call the “junk” when carving. But other than that, I try to keep my hands all over it. Early on when I was building, I’d give myself a little bit of a hard time in thinking, “I should get my act together and get this CNC thing because it’s the new way,” but I kept putting that off and just building the way I had done before, hand-carving the plates. After a while, I realized that’s just not me. I think it’s okay to use automation to produce something that’s not crucial to tone production. Carving the tops, fitting tone bars, and tap tuning are the types of things that are crucial for me to, as I call it, “keep my hands all over.” So, while I use the pantograph to rough out the junk from the outside of the top plate, the inside I still carve all by hand. It’s just a matter of feeling the top of the plate as I go, feeling the flexibility, tapping the whole way. The more I keep my hands on that thing, the more I’m able to control the tone production. There’s a vast array of skill sets that come with building an instrument, and that’s the interesting thing about lutherie. I’ve noticed that over the 35 or so years I’ve been building, I’ve developed my eye and my ear. When I built my first left-handed F-5 mandolin, I used the same shape only reversed, but it looked wrong, but when I flipped it over, it looked fine. I realized that when you spend 30 odd years working on something specific, your eye and ear get very attuned to things to the point that it can drive you nuts. You’re hearing particular things that are minute, that perhaps other people can’t hear. 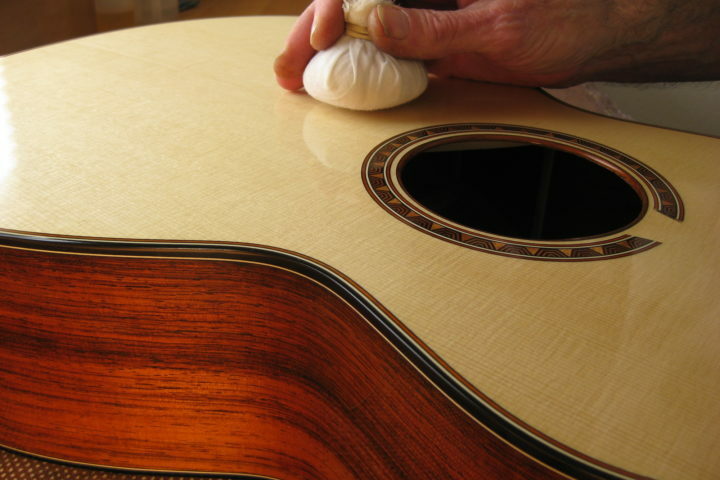 With carved top instruments especially, you have to know how to carve, cut pearl, sand correctly, which glues to use, the right finishes and colors. Any of which could be a career in themselves. 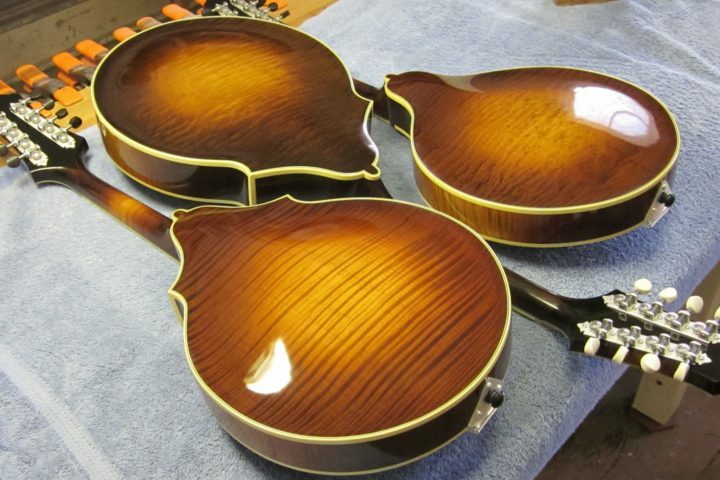 Also, when you look at Lloyd Loar instruments, they’re all different, they all have their own little quirks. Not just each batch, but each instrument. With each one, you can see peoples’ hands all over it. Each one has its own character because of that. 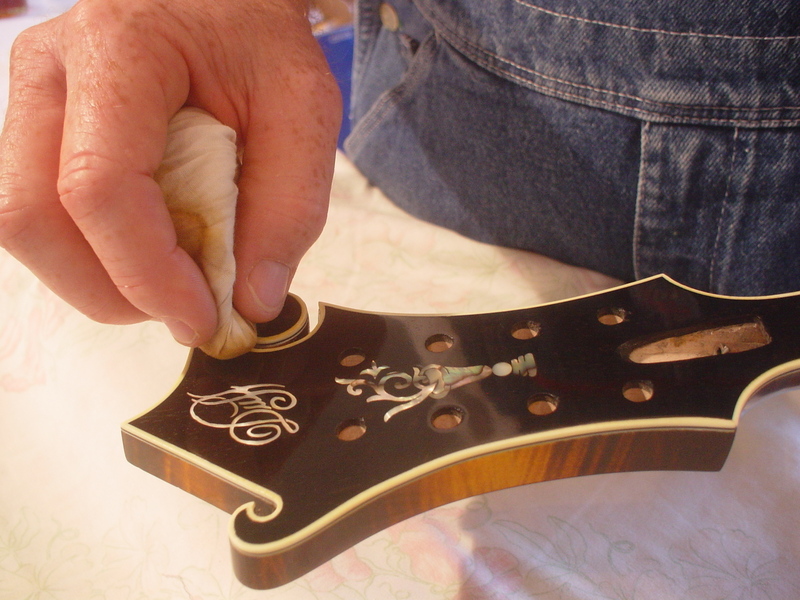 [Fellow Australian mandolin builder] Steve Gilchrist said to me, “There’s just enough imperfection to be perfect.” You want a certain level of consistency, of course, so that people get what they’re expecting, but each instrument should have its own individual personality. 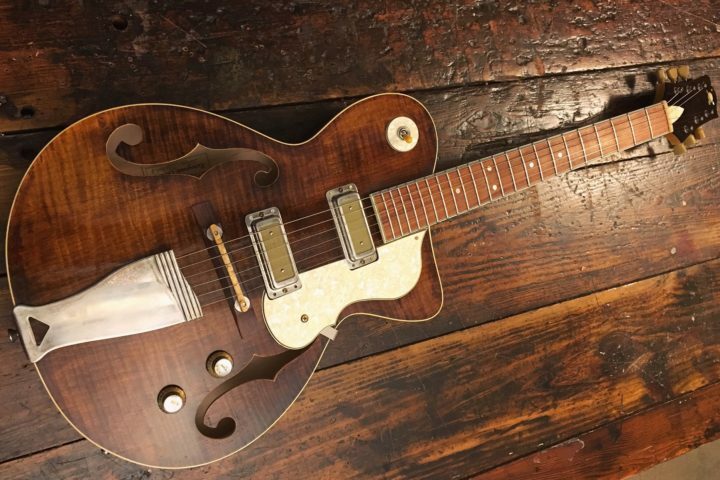 FJ: Plenty of mandolin builders have modeled their builds after the Loar-era instruments from Gibson in the 1920s, yet yours have long been regarded as some of the best of the best. What do you think it is that makes your instruments stand out? PD: I am pretty fixated on this particular instrument from this particular era that was only three years long, but, as I’ve said, has so much variation. I was so fascinated yet isolated from Loar-era mandolins for so long that I became fixated. When I finally got to hold one after quite a few years of building, looking at pictures, listening, and all that, the first thing that struck me was how rough it was. I built these instruments up to be the holy grail, and in your mind, the holy grail is perfect. But in this case, it’s not. It dawned on me that the craftsmen who were building these instruments were not trying to emulate anyone. They were just building instruments. You’ll sometimes see Loar-era F-5s with what I call the “five in the afternoon on a Friday sunbursts” that just had to be done. There was some rough cutting and the binding wasn’t always perfect, and I find that really fascinating. You’ve got to produce something, especially when it’s paying your mortgage, as best you can, and it needs to feel right and sound right. And if it doesn’t, you need to be prepared to fix it. You have to build up a tough skin because you don’t start producing something like an F-5 and get it perfect on the first try. The more you build, the more you learn. I think that finding the right materials is of course another factor. To get wood, I got to the U.S. and select the wood in person rather than just call. I went to the States in September and drove halfway up the mountains in Virginia to find sugar maple for archtop guitars, and the supplier says, “It’s funny, you and Gilchrest are the only guys who come up here.” I’m sure other people do, but if you want the best product, you need to properly choose what you’re working with. I fly halfway around the planet and drive seven hours, and I suppose that people know you mean business. FJ: Do you have any upcoming projects you’re particularly excited about?